FLAT IDLER PULLEY for SNAPPER 1-3850, TROY BUILT, Huffman, Lawn-boy, Simplicity, Toro and more listed. Home > Lawn and Garden > Lawn Mower Idler Pulleys > Snapper Idler Pulleys - for Lawn Mowers > 280-032, FLAT IDLER PULLEY for SNAPPER 1-3850, 7013850 and others listed. 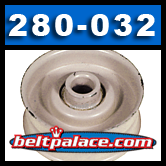 280-032, Lawn Mower FLAT IDLER PULLEY for SNAPPER 1-3850, 7013850 and others listed. FLAT IDLER PULLEY for SNAPPER 1-3850, 7013850 and others listed below. This Idler Pulley replaces: AYP 4933H, AYP 78744, CASE C15672, CASE C23535, FMC 171-0566, HAHN 27829, HAHN 451182, MTD 756-0137, NOMA 27332, SNAPPER 1-3850, SNAPPER 7013850, TORO 3-4244, TORO MW8821, TROY BILT 1710566, TROY BILT 1710567, TROY BILT 756-1207, WHITE 1710566, YARDMAN 1626-69. Replacement for Allen Lawn Doctor Scarifier, idler drive pulley.